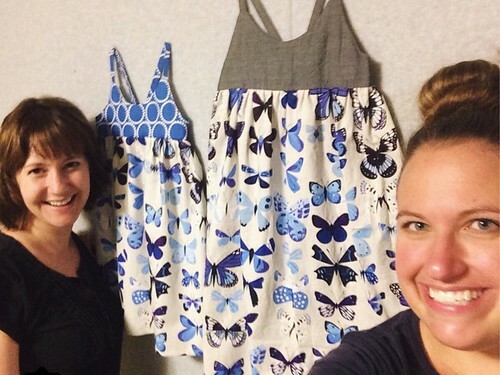 Earlier this summer, my friend Emily was in town to visit her family and she stopped by one evening for a sewing date. I LOVE when she does this. She always introduces me to a new pattern and has great projects going. It is such a treat for me to sew with someone else! I’m usually creating on my own and trying to keep myself motivated. That can be hard. So I was just tickled to have Emily in town and ready to sew. She had a pattern she was going to sew for her two adorable little girls, the Hummingbird Dress from RabbitRabbitCreation on Etsy and she told me in advance that she was going to do that. So I decided that I would go ahead and sew one with her as well. We both picked out our fabrics and met at my house to make them. We had picked the EXACT same fabric! Great minds!! 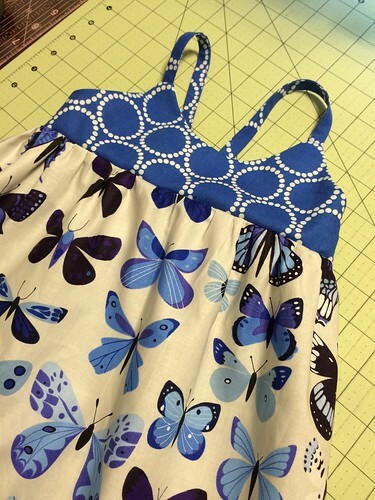 We both love color and thought that this Lizzy house butterfly fabric from her Natural History line would be perfect for the skirt of the dress. Emily paired hers with a chambray and I paired mine with the mini pearl bracelets also by Lizzy House. We both loved each other’s choices. The pattern is a clever little pattern with a back gather and two straps; just perfect for summer girls romping around. Our two girls are only a year apart but my dress looked so little compared to hers! I was worried it wouldn’t fit Caitlyn. But as you can see below, it was perfect. I love how it looks on her…now I just wish she would wear it more. She of course decided she doesn’t like the blue top. Le sigh. I just can’t win. She loved it at first but hasn’t worn it again since that first week. But I still love it and that is what matters. I might steal it back from her and donate it to charity if she is not going to wear it. 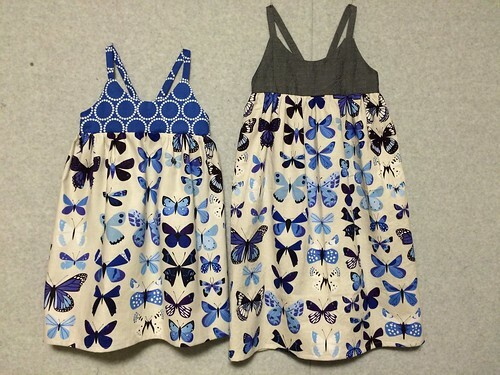 I think that it would perfect for the Little Dresses for Africa! I just read your post agin about dresses for Africa. I really want to make a few before year end after reading a great book about a young girl's mission in Africa and her 14 daughters. Your dresses always inspire me more. Oh my – I would love a dress just like that – it is beautiful! If you decide to donate it that is great, obviously, but if you wanted to sell it I bet you would get a buyer in an instant (maybe even me!). It's an adorable dress! 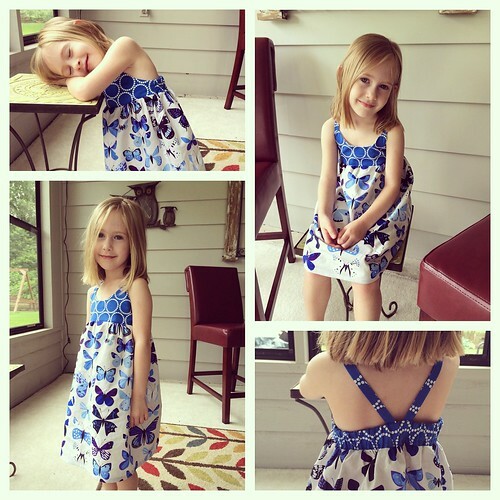 adorable dresses, have you tried patterns from peek a boo patterns? hers are adorable too.